In a season that has been anything but routine for Duke, the Blue Devils won the Atlantic Coast Conference Tournament as it had never been done before. Jayson Tatum took over in the final three minutes, making key plays all over the floor, and No. 14 Duke became the first team to win the event with four victories in four days by rallying past No. 22 Notre Dame 75-69 on Saturday night. The freshman forward finished a spectacular week in Brooklyn with 19 points and eight rebounds for the fifth-seeded Blue Devils (27-8). Duke won its first ACC Tournament championship since 2011 and its 20th overall, most in league history, and the 14th under coach Mike Krzyzewski. 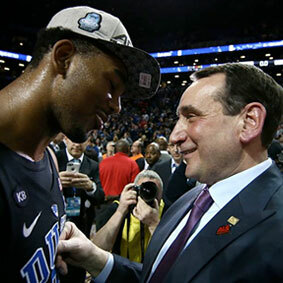 “I’ve been on a lot of good journeys, but this was such a good one,” the 70-year-old Krzyzewski said. Bonzie Colson was a beast for third-seeded Notre Dame (25-9), with 29 points and nine rebounds. “It’s one of the great performances in championship game history,” said Notre Dame coach Mike Brey, the former Krzyzewski assistant who is now 5-4 against Duke with the Irish. The Blue Devils came from double digits down in the second half to beat both No. 10 Louisville and No. 6 North Carolina to get to the finals at Barclays Center and then came from eight back with 11:35 left to defeat the Irish. And a lot of Tatum on Saturday night. He made a running hook to give Duke a 65-62 lead, but Colson’s 3-pointer with 2:25 left tied it. Tatum hit one of two free throws to put Duke back in front, and then came through with the play of the night. Or make that, the plays of the night. He blocked Steve Vasturia’s drive to the hoop and then went coast to coast for a layup to make it 68-65 with 1:33 left. Matt Farrell pulled Notre Dame within two with a couple of free throws before Tatum showed off another skill, driving and dishing to Matt Jones for a 3 to make it 71-67 with 50 seconds remaining. It was Jones’ only basket of the game. “It was the shot of the game,” Krzyzewski said. Tatum then all but sealed it, getting behind the defense on an inbounds pass from Jones for a slam while being fouled. Tatum completed the three-point play for a 74-69 advantage with 25 seconds left. Luke Kennard had 16 points for Duke and was selected tournament MVP, but it was really Tatum’s time to shine. He averaged 22 points and 7.5 rebounds in four games.